Gov. 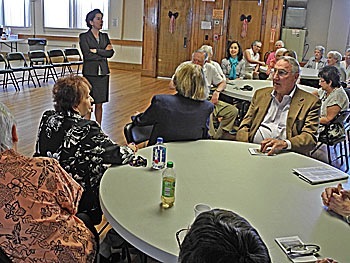 Gina Raimondo speaks at Portsmouth Senior Center. 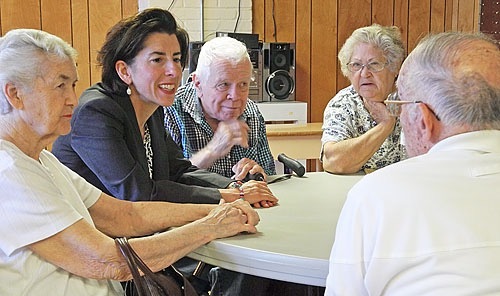 During a visit to the Portsmouth Senior Center this afternoon, RI Gov. Gina Raimondo spent 45 minutes talking with more than 30 seniors and presented an award to one of the center's volunteers. She also had some advice for the the Senate Finance and Labor committees taking up her proposed minimum wage increase at a hearing later today (H5175/Article 20). "I'd say pass it," Raimmondo told harddeadlines. "Last year, I called on the Assembly to raise the minimum wage, and they didn't, and I think we missed an opportunity, because folks in Massachusetts and Connecticut got a raise. They both increased; our people deserve a raise too. You shouldn't be in poverty if you work full time and I think it's the right thing to do." Raimondo spoke briefly to the members before spending the bulk of her time sitting at each table to talk with attendees individually. In her remarks, she noted that her past three budgets had recommended increases in funding for senior centers, Meals on Wheels, and tax breaks on Social Security income." "You guys have earned it, and you deserve it," she said. Gov. Raimondo presents award to Edmund Silveria. 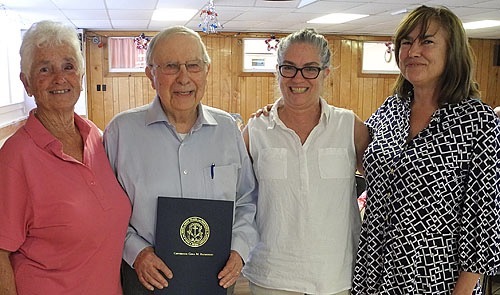 Raimondo presented long-time volunteer Edmund B. Silveria with a certificate "In recognition of extraordinary commitment to community service." Silveria, who said he'd been volunteering at the center since he retired in 1984 called the award a "big surprise," as he posed proudly with his family. Local elected officials were in attendance as well. 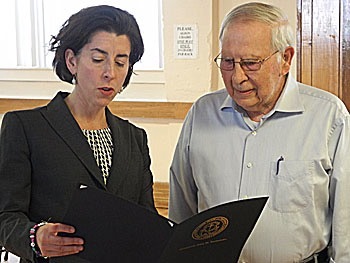 Raimondo introduced Sen. Jim Seveney (D-11) as "one of the best guys up at the State House," and talked with Rep. Susan Donovan (D-69) and Portsmouth Town Councilor Linda Ujifusa. Edmund Silveria with his family. Gov. Raimondo speaks with attendees. Gov. Raimondo with senior center staff and elected officials.